Independence Day or Fete de l’Independence is a public holiday celebrated on 18 November. Moroccans celebrate this day due to Moroccans’ independence from French on 18 November 1956. Morocco was French protectorate for 44 years from 1912 to 1956. Unlike America, Moroccans commemorate this day differently with lesser extravagance. Independence day celebration starts in advance, Moroccan streets are adorned by Moroccan red and green flags, TV broadcasts, commemorating historical figures and events, functions at school or colleges and much more. 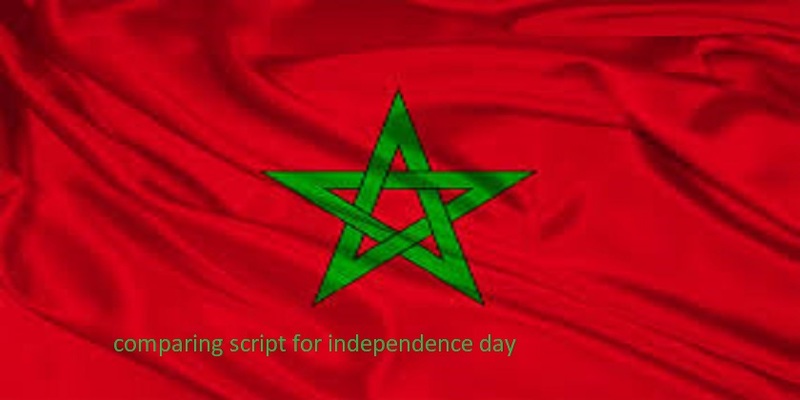 The article below is the comparing script for Moroccan independence day. Anchor 2: Me (name); your hosts for today. And we from the core of our hearts wish you all happy independence day. Anchor 1: Moving forward it is time for the national anthem and flag ceremony. For that purpose, we would bother you to stand. Anchor 1: The secret to living well and longer is: eat half, walk double, laugh triple, and love without measure. Now appreciate our fairies for the welcome performance. Anchor 2: Wow! it was a splendid performance. A round of applause for them, please. Anchor 2: Now, we would like to call (name) for speech. Please, put your hands together. Anchor 2: Hey (name of the speaker), did you know that an Arabic name for Morocco, al-Magrib al-Aqsa, means “the extreme west” and attests to Morocco’s place as the westernmost country in the Arab world. Anchor 1: That’s interesting! And did you know that Morocco is only 8 miles (13 km) from Europe, across the Strait of Gibraltar. Anchor 2: Oh yeah! And now it is time for some involvement of yours. So, you will be asked some general knowledge questions and you have to guess the answers. Anchor 1: Real life is messy, the drama is shaped version of real life. So, to present that, we would like to upon (name of the performer and the group). Please, a huge round of applause for them. Anchor 2: Welcome back to the theater of life. It was splendid performance. Anchor 1: Now it is the time to say good bye but before that, we would like to call upon respected Mr.___ to speak a few words here on the stage. Anchor 2: Thank you, sir. Anchor 1: At the end of the day, the only thing that is worthwhile is your freedom. So, once again wish you all happy independence; peace, love, health, prosperity, and happiness.